Rustic Bread ~ I Can Do That! Rustic Bread is one of the 3 recipes that we MellowBakers are baking this month of April, 2010. The other 2 are Bagels, and Light Rye Bread. 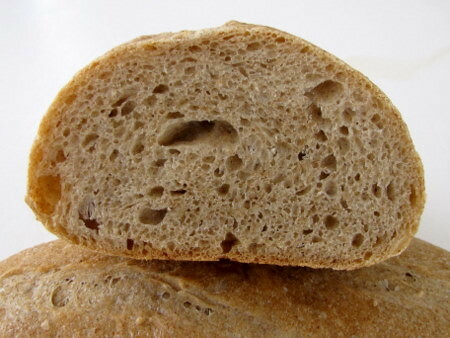 Jeffrey Hamelman's Rustic Bread recipe is a fairly easy bread to make although it takes 2 days. The first day is for the preferment which is making a stiff dough with flour, water, salt, and a small amount of commercial yeast, leaving it on the kitchen counter for 12 to 16 hours. The next day is pretty much the same, mix bread flour, a little whole rye and whole wheat flour with water, salt, yeast, and the preferment. Bulk fermentation is 2½ hours with two folds after every 50 minutes, then the dough is divided and shaped into rounds [I shaped mine into fat batards] and made to rise for 1½ hours then off they go in a 450°F steamy oven . Easy peasy. The bread is soft, chewy, and flavorful and I like it even more the next day, but not after that. Well, they didn't last beyond 3 days so no problem there. This could be a regular bread in my house. It's good for sandwiches or dipping into soups or stews. Beautiful bread Oggy! Glad it turned out so nicely. Although it's not sourdough, I found the flavours a little more obvious the next morning, maybe 16 hours after coming out of the oven. And definitely I agree it was really a simple to make bread and one that cn be made any weekend, as long as you have 10 minutes the evening before to mix up the pre-ferment. Easy. I am looking forward to toasting this one in the morning. Yours looks delicious. Sounds delicious! I can't wait to make this one . . . with soup! Paul, that's what I do, make the preferment at about 5PM and it's ready by 8 or 9AM. Wonderful loaf, I really love this bread. I don't know where you live, but if you live in a humid region, you shouldn't spray water in the oven, before you bake it. That's my experience. Hi Zorra, I don't spray water in the oven. I have a preheated cast iron pan on the floor of the oven and pour hot water in it a few seconds before I slide the breads on the stone.